Yes, adult stem cells, not embryonic, nor fetal are found throughout our body ranging from our own blood to fat, to bone marrow, just to name a few. These cells have the ability to differentiate into bone, cartilage, tendons and ligaments and aid in the regeneration of injured tissue and accelerate healing. Dr. Bennett uses adult bone marrow derived stem cells typically procurred from the back of the pelvis bone. There are three (3) sources of stem cells being used in orthopedics; cells from fat, cells from blood, and cells from bone marrow. Why do we prefer bone marrow? Bone marrow’s progenitor/stem cells are better suited for regenerating cartilage, ligament and tendon and can be used as a direct application (in-office-injection) or as an adjunct in surgery to aid in regeneration and healing of injured tissue. This technique is point-of-care, the cells are not manipulated and are utilized as treatment at the same time of the harvest. The harvest is from the posterior (back) portion of the pelvic bone; a very short anesthesia is required. Patients rarely complain of any discomfort following the harvest, and the marrow taken grows back! There continues to be expanding indications for the use of bone marrow derived adult stem cells. We are using them for cartilage damage, arthritis, rotator cuff tears, tendon tears and hip labral injuries. Why do we not use stem cells from fat? The harvesting of cells from fat has carried over into orthopedic applications from plastic surgery applications. While they are a great source for plastic surgery and there are large numbers of them found in fat, cells, whilst lower in number, from the bone marrow are better suited for orthopedic applications. Improvement from stem cell Injections? Early decrease in pain may be seen as quickly as 2 weeks, but the whole event may not be optimized for 3-4 months. How long would you estimate this treatment would be effective? This is an evolving field; and as such, it is still considered investigational from an insurance standpoint. However, the cells will help to regenerate new tissue in the proper environment and the science suggests that the tissue may be as robust as nor mal tissue. People who have had shoulder surgery and cartilage surgery with stem cells applied recovered quicker than those with the same surgery without stem cells. What are the advantages of doing Stem Cell Therapy as opposed to a surgical procedure? Firstly, as opposed to surgery, the risks associated with the procedure are minimal with the greatest risk being the possibility that it doesn’t work. The bone marrow is replenished, rarely do hematomas form from the aspiration site and because only one aspiration from the pelvis is performed, the risk of any bone fracture is negligible. The advantages are similar in the sense that tissue regeneration may be achieved without surgery. The aspirate is filtered to remove bone fragments. The concentrated cells are suspended in plasma and injected with PRP. Bennett Orthopedics utilizes only bone marrow aspirate concentrate with “no manipulation” of cells as an adjunct to treating arthritis, cartilage, tendons and rotator cuff injuries. Below is a list of just a few articles in Medical Journals discussing the research on the benefits of using Stem Cell Therapy in orthopedic applications. – Osteochondral Lesions of the Knee: A new one step repair technique with Bone Marrow-Derived Cells. Dr. Bennett is an esteemed, experienced Sarasota orthopedic surgeon, internationally known as an expert shoulder and knee specialist. Designated one of the Top Orthopedic Surgeons in Sarasota by U.S. News and World Reports, Dr. Bennett has been practicing since 1995. As a sportsmedicine physician, he treats all injuries, but has been a pioneer in the areas of shoulder surgery, adult stem cells, and platelet rich plasma (“PRP”) treatment of joints. He sees patients from various parts of the world who seek his advanced expertise in treating hip, knee, elbow, and shoulder injuries. Arthroscopic rotator cuff surgery, minimally invasive custom knee replacement, cartilage regeneration, meniscus surgery, ACL reconstruction and hip arthroscopy are common procedures performed by Dr. Bennett. You will find you have come to the right place at Bennett Orthopedics and Sportsmedicine. Regenerating the Youth in You! Call at (941) 953-5509 or submit our online form. Much of the controversy surrounding stem cell treatment is the result of common misunderstandings about the source of the stem cells used. The stem cells used by Dr. Bennett to treat hip, knee, and shoulder injuries come directly from the adult patient’s own body. No embryonic or fetal stem cells are ever used by Dr. Bennett! Your own body is a rich source of stem cells. They are present in every tissue: bone marrow, blood, fat, heart, tendons…even brain tissue. This fact is especially important, because certain types of stem cells (synovial cell derived, bone marrow, etc,) are better suited for certain types of injuries. Bone marrow and synovial stem cells are ideal for treating orthopedic injuries, while fat stem cells are more appropriate for plastic surgery. To a lesser extent, there is also some lingering controversy about the newness and lack of long term studies of stem cells. However, Dr. Bennett, as a pioneer in the orthopedic use of stem cells, has been performing these procedures for years, which has allowed him to track his patients’ results and further refine his methods. As evidence of the effectiveness of stem cell treatments continues to grow, some have suggested that joint replacement surgeries will eventually be thought of as “barbaric” compared to less invasive injections of one’s own cells. This is a simple injection of stem cells into the knee. Research has shown that stem cells delay cartilage deterioration. Another controversial aspect of stem cell treatment is the concern that storing stem cells damages DNA. This is not relevant to the treatment provided by expert orthopedic surgeon Dr. William Bennett, who uses the stem cells immediately after they are extracted from your bone marrow. Your stem cells are never sent to a lab or grown offsite. They are ready and used immediately to heal your injury. Stem cells from the bone marrow are best for orthopedic bone, cartilage, tendon, ligament repair. Some doctors are calling platelet rich plasma (PRP) “stem cells”, and offering the cheaper prices normally associated with PRP. 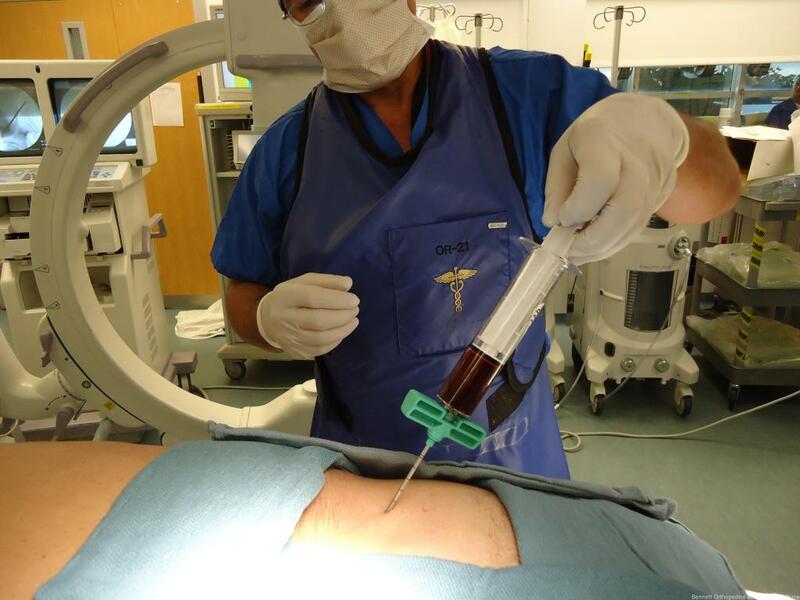 While the blood and some types of PRP do have some stem cell content, these hematologic (blood-derived) stem cells are not the best-suited for regenerating tendons, bone, cartilage, or ligaments. Other doctors may offer fat cells, which are also less than ideal for specific orthopedic uses. Dr. Bennett, the Sarasota orthopedic surgeon who was one of the first in his field to include stem cells as a major part of his practice, only uses bone marrow derived stem cells to repair shoulders, knees, and hips. So while Dr. Bennett’s price may not be the cheapest, he offers the best value, since you are getting the most appropriate cells most likely result in the best outcomes. This patron polo player won the US Open Polo championship following adult stem cell treatment for a hip condition. Dr. Bennett uses stem cells alone, instead of surgery, and he sometimes uses them in combination with surgery. As an expert shoulder specialist and knee specialist, he uses his years of stem cell experience to make the best recommendation for your unique case.